A family physician and sufferer of Attention Deficit Disorder explodes the conventional wisdom that A.D.D. is a genetically based disorder, declaring instead that it is a response to environmental conditions that fail to provide emotional or physical security. Reprint. I don't know if I'm convinced that his theory of the source of ADD is the only source - but he addresses feelings I have so precisely that it must be significant, and he addresses them with the subtlety and real understanding only an intelligent and sensitive fellow sufferer who has grappled with the same problems could. One who writes well too - it's an entertaining and often a moving read. If you or your child suffers (or you suspect suffers) from ADD, read this. It opens up avenues of growth and healing for those with ADD that no one else has - and they could be recommended to many human beings with positive results, but could be life changing to those with ADD. I have lived for 30 years with an ADD husband and his daughter, abandoned by her mother before the age of two. Both were diagnosed by psychiatrists (not family practice physicians, as is Mate.) Some of the behaviors which Mate describes are recognizable in one of them, but not the other; some cannot be seen in either; some are issues for both. Mate’s hypothesis that ADD is the result as much of nurture as nature is enlightened, as we now know nature and nurture together are responsible for all the positive and difficult aspects of our physical and emotional health. Though we may be born with a proclivity for a disease or disorder, we do not have to open those genetic envelopes. So I applaud Mate for making this point, and taking the inevitability out of the ADD equation. But he severely undermines any positive take-away on this score by focusing on the role of early childhood trauma in bringing about ADD behaviors, and placing the responsibility solely on the shoulders of mothers. This blame is not only unhelpful, but downright detrimental to ADD mothers everywhere who often feel overwhelmed and abandoned in the face of it. The weight of this finger-pointing is countered with almost NO help at all, as he offers nothing more than the same suggestions which may be found in any of the hundreds of pop-psych magazine articles that are published in any given month. 5.0 out of 5 starsGreat resource for clinicians and parents! 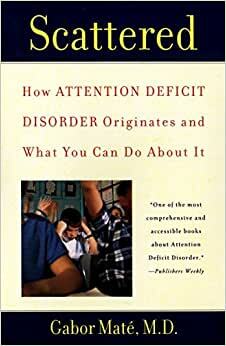 As a mental health clinician who works in a high school with teenagers, this book has been so helpful in putting a lot of the typical adhd behaviors that we see into a larger context. This was my first Dr. Mate read, and I've since become a big fan of his approach to early traumatic environments and how that affects the person. ADHD is way more than a "brain" issue, and medication is only a sometimes helpful band-aid to a larger, deeper problem. This book is easy to read and gives great tips to parents and schools working with both children and adults who suffer from this disorder. 5.0 out of 5 starsA MUST read for anyone with or interested in ADD. Anyone who has ADD or has a family member/child with ADD needs to read this. It completely changes everything you believed and makes total sense. I wish I had read this when my son was young so I could have implemented some of the suggestions. However, even though he is now 20, there are still many things you can change in your interactions and when advising. I read this because it was suggested by my psychiatrist at the VA. My psychiatrist was the person who I was comfortable to speak with and it pains me so to finish this book after 2 years. I am planning to visit him and thank him for this suggestion as it was a great read. I wish I would’ve read it sooner and had more things to talk about but he had another better job lined up for him. There is no greater lesson in life than regret and the cliche of not going to live my life without any regrets is truly false, because without this pain in my heart I would not have appreciated this book and why he suggested in the first place. I wish I don’t have any regrets but at the same time I have this lesson learned and I will not forsaken this feeling.